These colorful glass beads feature the shape of a blossoming bellflower and will add charming detail to your jewelry designs. 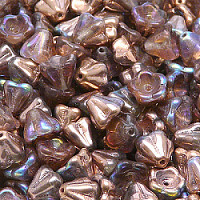 These versatile beads can be incorporated into all kinds of jewelry designs and look particularly beautiful when used as bead caps and dangles. Slight deviations in color shades are unavoidable. Copyright © 2007 - 2019 8beads.com.